Clean and slice the anchovies into fillets. 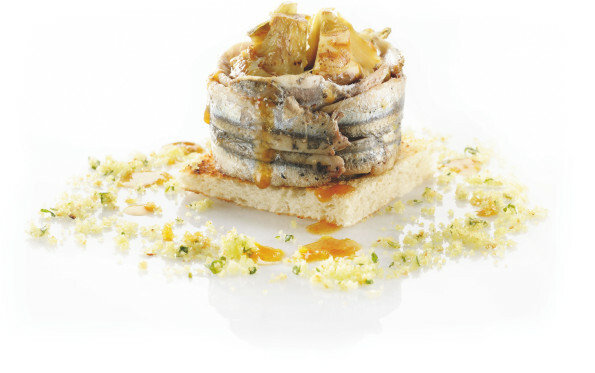 In a round mould put the Zero Olio® pepper and lemon artichokes in the middle and the anchovies around the sides. Rub the bread with garlic, add thyme and the extra virgin olive oil. Put the flavoured bread on the pie and cook in a hot oven (220°C) for a few minutes. If you don't have the time to prepare the anchovies, or just don't feel confident about doing it, you can always use Delicius Anchovies instead. Serve with a large green salad or with vegetable and/or fish side dishes. Traminer Friuli Aquileia DOC Superiore, Verdecchio di Jesi, Greco di Tufo, Sangiovese. Looking for a tasty, easy to make, appetiser for your guests? Or perhaps you want to prepare a light but intriguing snack? Then you have to write down this recipe here! Here a crispy garlicky bread base hosts fragrant spicy artichoke hearts and fresh anchovies, guaranteeing taste delight and satisfaction! Serve it during a party or before a dinner as an appetiser, or after a first dish as a light secondo.